Not what you think. 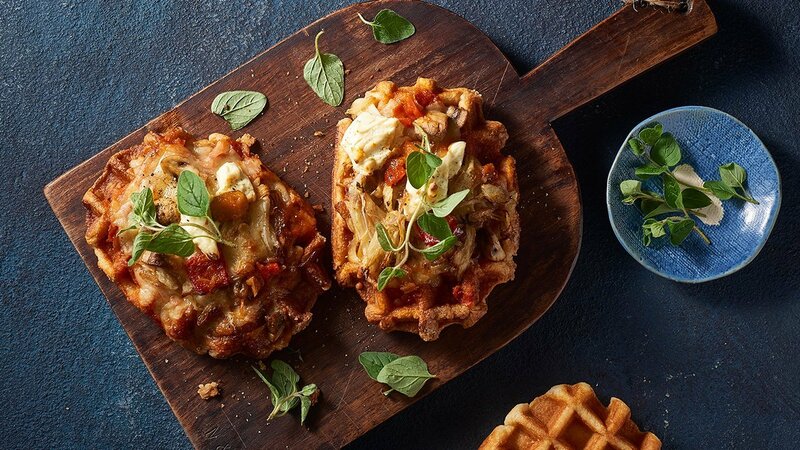 This waffle pizza is topped with all the favourites and baked until golden brown. Different and delicious. Sift flour and baking powder into a medium bowl. Add salt and 100g sugar, and stir to combine. Whisk milk, oil and egg yolks together in a bowl. Add to flour mixture and whisk until smooth. Use an electric mixer to whisk eggwhites in a clean, dry bowl until firm peaks form. Use a metal spoon to gently fold one-third of eggwhite into flour mixture. Add remaining eggwhite and fold until just combined. Preheat oven to 75 degree Celsius. Place a wire rack over an oven tray. Brush waffle iron with a little melted butter. Pour 3/4 cup (185ml) of batter into waffle iron, close lid and cook for 3-4 minutes or until golden. Transfer waffle to the wire rack and place in the oven to keep warm. Repeat with remaining melted butter and batter. Take each waffle and spread with KNORR Italiana Tuscan Vegetable Sauce GF. Sprinkle with mozzarella, onion, mushrooms and then sliced beef. Top with Philly Cheese and bake at 180 degree Celsius for 10 minutes or until golden brown.